The goal of responsible stewardship is to use N fertilizer as efficiently as possible and minimize preventable losses from the soil system. Urea is the most widely used solid nitrogen (N) fertilizer in the world. Understanding its behavior is important for getting the maximum benefit from this important plant nutrient. Nitrate is critical for supporting plant growth, but it is vulnerable to leaching through soil. The goal of minimizing nitrate leaching requires maintaining only enough nitrate in the root zone to meet the nutrient demands of the crop and applying the lowest volume of water to meet crop transpiration demands. Understanding the process of nitrification is central to managing the soil nitrate supply. Careful management of ammonium nutrient sources can help achieve the desired crop nutrient supply and minimize losses of nitrate. Denitrification is a natural soil microbial process where nitrate (NO3-) is converted to nitrogen (N) gases that are lost to the atmosphere. Denitrification occurs when soil bacteria use nitrate for their respira-tion in the place of oxygen in the air. This process occurs most rapidly in warm, wet soils with an abundance of nitrate. 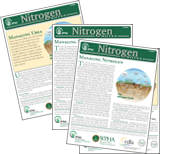 Nitrogen (N) fertilizer is essential for grow­ing most crops. Some ammonium and urea-based fertilizers are susceptible to loss as ammonia (NH3) gas, especially when left on the soil surface. Ammonia losses from fertilizer can represent a significant economic loss and may have a negative effect on air quality and human health. The major factors controlling NH3 losses from fertilizers and animal wastes are discussed here.